Indoor Entertainment: Bowling, Skating, Bocce Ball & More! You are here: Home / Indoor Entertainment: Bowling, Skating, Bocce Ball & More! More About Indoor Entertainment: Bowling, Skating, Bocce Ball & More! There are numerous indoor entertainment facilities in Northwest Indiana. Visit the individual websites for more information. snack while having fun and keeping the body in motion - play pool or games in the arcade - the lounge is a great place to meet friends after work for an adult beverage while taking advantage of one of our daily specials. Our establishment deals in all different services related to bowling and family friendly get-togethers. Our services include: Banquet Hall, Bowling Balls, Bowling Equipment, Catering, Country Pub Bar, Grip n Rip Pro Shop, Martha’s Kitchen, and Wedding Receptions. Open bowl, men’s leagues, women’s leagues, mixed leagues and lounge. A family house with sixteen synthetic lanes. Whether you are looking for bowling fun or a challenging sport, we are the place for you and your friends! We offer men's, mixed and specialty leagues as well as birthday parties, fundraisers, and special events. Every Friday and Saturday, you can join us for Cosmic Bowling with lights, music and prizes. Also, be sure to have a cool one in Ten Pin Lounge or a hot tasty treat in Striker's Cafe. 32 Lanes of Bowling, Video Game Arcade with Ticket Redemption, Roller Skating Rink, Go-Karts, 18 Hole Miniature Golf, Paddle Boat Soakers, 8 Billiard Pool Tables, Air Hockey, Bean Bags, Kids Bounce Houses, Empty Pockets Saloon, Panhandlers Pizza. We also have Meeting/Party/Banquet Rooms for your next Event! Midwest Training & Ice Center is the region's largest state-of-the-art training facility for Ice Hockey/Figure Skating and Gymnastics. MTIC provides the highest quality instruction to athletes of all ages and abilities. Sport specific training is available in gymnastics, ice hockey, figure skating, and cheerleading. For the recreational athlete, Midwest Training & Ice Center offers public skate sessions, drop-in hockey and open gym. Open bowling, arcade, leagues, birthday parties and special events. Our friendly, family owned 60 lane state-of-the-art facility is dedicated to the service, sport and entertainment of every aspect of BOWLING . . . League Play, Recreational Bowling, Parties, Fundraisers, Cosmic Bowling, & Group Outings just to mention a few. Ray's Lanes has several lanes of fun that's great for friends and family. We have group packages, or you can just stop by for a fun night out. Set 'Em Up Lanes & Lounge is located downtown Griffith and has many things to offer. As an eight lane bowling alley, this is the perfect place to hold fundraisers, private parties, or kids birthday parties. We offer a full restaurant menu (dine in or carry out) and a well-stocked bar. In addition to live entertainment, we offer open mic night and karaoke. We also have a pool table, pinball machines and 13 TVs throughout the bar and bowling alley. Interested in leagues? Be sure to inquire about pool and bowling leagues. Sk8 World is now open! Formally known to Porter County Indiana as R-Way, Sk8 World has been completely updated and remodeled to offer the latest amenities. Fresh floor, fun atmosphere, with amazing laser lighting and only the best DJs playing the hottest music. Sk8 World is proud to bring a fun family atmosphere back to the region. We will have open skating, overnights, and offer private parties to accommodate any special event. Our updated concession stand will offer a wide variety of snacks and food for all. Give us a call today for our latest grand opening information, specials and promotions! Open bowl, league play, special events and an arcade. Striker’s Arcade and Redemption room has over 30 games to test your skill and agility. Collect your redemption tickets so you can redeem them for some cool prizes. Open bowl, league play and special events. 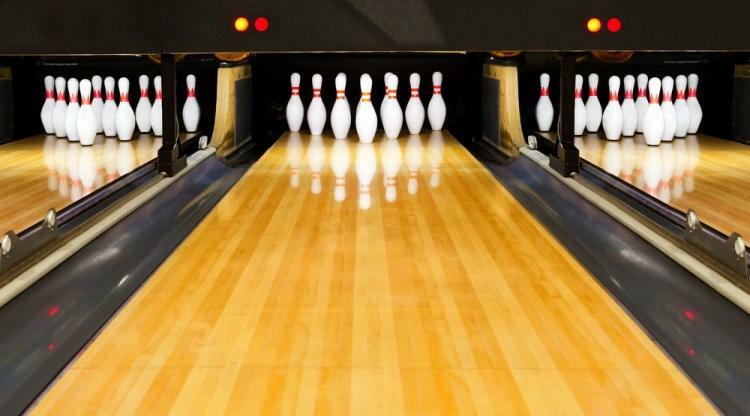 We are a sixteen lane bowling center certified by the ABC and WIBC, located one block east of Crown Point's historic courthouse and town square. In addition to our variety of bowling leagues, The Super Bowl, Inc. features a video arcade, cosmic bowling, party packages and endless good times in the Final Frame Lounge. We also have free wireless internet. While enjoying all of this, one can also enjoy some great food from our grill. Indoor Bocce League. Thursday nights, starting at 6:30pm. Must register!